See the Great Pyramid of Cholula and Puebla’s UNESCO-listed historic center on one easy, all-inclusive tour from Acapulco. The largest pyramid on earth by volume, Cholula surpasses even the Egyptian Pyramids..
See another side of Mexico with this trip to the capital city. Enjoy comfortable transport from Acapulco and choose to explore DF in one or two days. 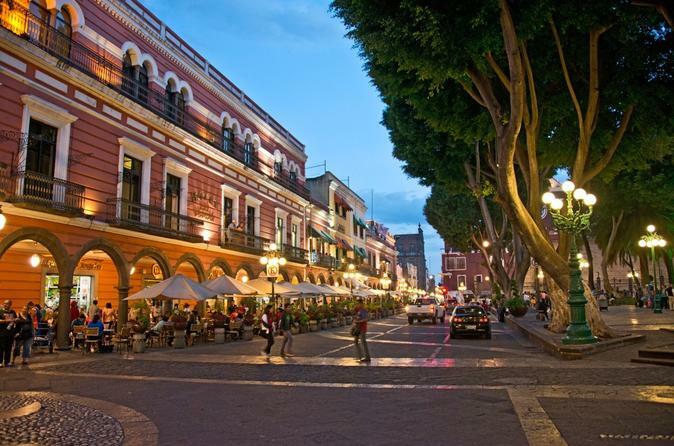 Visit important colonial buildings like the Cathedral and National Palace, as well as archeological sites like the Templo Mayor and the pyramids of Teotihuacan. Your local guide shares knowledge of the history, cuisine, architecture, and culture of this incredible city. Your adventure will begin in your hotel where your friendly, fun and knowledgeable Driver-Tour Guide will pick you up in a very comfortable Van or Sedan (depending of your numbers) where you can rest and even have a nap while your capable driver takes into the road to Mexico City. Once you have arrived you will go visiting Downtown Mexico City, “The Plaza de la Constitucion” where you will visit The National Palace, The Cathedral and The recently discover Archaeological Site of “The Templo Mayor”, the very core of the Aztec Empire. Always in company of your knowledgeable guide visit this which is the Political, Economic, Artistic, Religious Center of this vibrating country while in the Downtown area go visiting the Palace of Fine Arts. On your way to The Pyramids you will be making a stop for a Buffet Lunch (included). After this your tour will go all the way to the neighboring state of Mexico for a thorough visit of the Sacred City of Teotihuacan, admire the Pyramids of the “City of Gods” that reached it peak during the 3rd and the 5th Centuries A.D. After this your One Day Tour will head back to Acapulco City. If you booked for the Two Day Tour you will be driven to your hotel in Mexico City. Visit historic churches, buildings adorned in hand-painted tiles, and a religious art museum, and get an introduction to the craft of Talavera tile-making. Later you’ll head to the Cholula archaeological zone. There, you’ll have plenty of time to explore the massive Great Pyramid. Learn about the history of the pre-Hispanic structures and see the Church of Our Lady of the Remedies, which was constructed atop the pyramid after the conquest of Hernán Cortes. In Puebla, you’ll get an introduction to this historic city’s UNESCO-recognized colonial center with a visit to the ornate 16th-century Church of Santo Domingo. The church’s Chapel of Rosary baroque interior is considered a wonder of the art world. Next, head to a former convent that’s now home the Museum of Religion Art, followed by a tour of workshops that make onyx and Talavera ceramics.